Rob Jr :: Korean First Birthday "Dol"
As Petite Productions is a kid-specific event planning company, we have the privilege of sharing in many milestone moments for our client’s, including a baby’s first birthday. What makes this event a little extra special above any other is that our “client” and birthday guest of honor is my little girl Sera! Wanting to also celebrate our heritage, our theme focused on showcasing various cultural Korean elements. In regards to the scale and importance of the event, Korean first birthdays can be compared to a Bar/Bat Mitzvah in Jewish culture or Quinceanera in Mexican culture. Granted a one year old might prefer a nap over having to pose in a party dress, but turning one in Korean customs is symbolic as there was a time when not many babies made it to this birthday. Throughout the years having a grand first birthday party continues to be an honored tradition for Korean families. 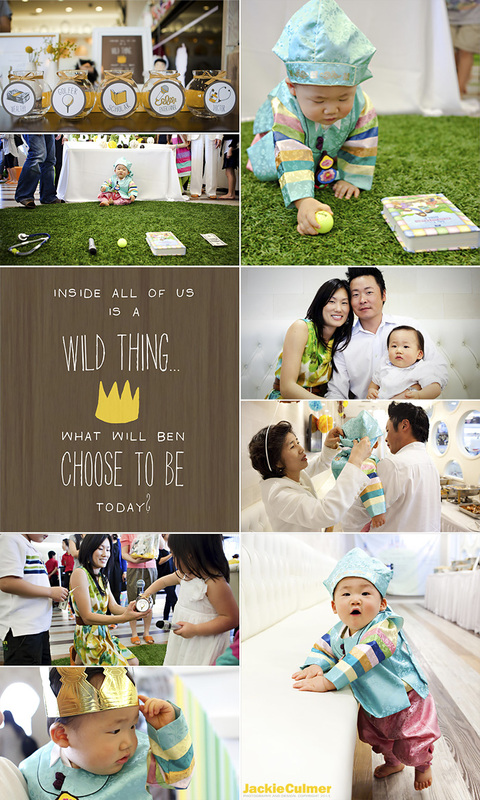 The overall concept to the theme was to highlight our Korean background, but using a more contemporary approach… and beyond all that, satisfy our main purpose in celebrating our daughter’s number one birthday and have a great time with our friends and family! Other than avoiding primary colors, our color palette was quite eclectic. Much of our design inspirations came from the traditional Korean dresses or hanbok that Sera and I wore. Reflecting a broad range of colors, patterns and textures, we incorporated all these elements into our décor, including the florals, linens, and cake. Nisie of Enchanted Florist created tall rustic arrangements of pink cherry blossoms for an Asian touch, with hanging globes of flower blooms and pink silk wrapped boxes filled with shades of blush and deep pinks, eggplant and celadon green. Our linens were blush matte satin linens with delicate vintage lace overlays. As Korean traditional fabrics have a taffeta-like quality to them, we added custom taffeta garden rose accents to our main table and chair treatments. Korean first birthdays highlight a main table called the dol sahng, literally meaning first birthday table. Ours fused traditional elements like gift packages wrapped in traditional fabrics and decorative towers along with a more contemporary floral name display created by Nisie. Flanked by impressive floral arrangements on stands, the backdrop was a custom board with a Korean symbol designed in crystal rhinestones. We interpreted the ever so popular sweets display with a Korean twist incorporating traditional Korean rice cakes displayed in not so traditional candy jars and cake platters along with a variety of nostalgic Korean candies, cookies and snacks. Our cake inspiration was primarily from Sera’s hanbok. The stripes on the top tier are typical to the design usually found on the bolero-like jacket worn on top, known as saekdong juhgori in Korean, which I wanted to incorporate to symbolize something more traditional. And of course we had to add a little sash ribbon at the base like the jacket sash. The bottom two tiers emphasized the dress colors and artwork of her hanbok. Since we couldn’t have our cake wear little shoes, our cake topper was the traditional shoes that accompany the hanbok attire. I sketched out the overall concept of the cake and presented it to Grace at Sweet Gems who brought what I had envisioned to life and beyond! As we wanted to keep the atmosphere of the party casual and energetic, I loved the idea of a taco guy, but that would spoil the plan for an all encompassing cultural experience for our guests! So we collaborated with my super talented chef friend who created a fusion menu of Korean style bbq tacos grilled to order, with kimchee quesadillas and mini Korean kalbi sliders. Yum!!! We also had a display of Korean style sushi or kimbap ranging from the more traditional meat and veggies to spicy tuna as cold appetizers. Beverages were a variety of Korean brand soft drinks and beers to complement the flavors of our menu. We also had a self serve ice chest filled with old-school Korean popsicles and ice cream as after meal refreshments. Fresh Korean rice crackers, similar in concept to popcorn only using rice, was also being popped on site, which kids couldn’t get enough of and guests got to take bags home as healthy favors! Korean Classical Music and Dance Company entertained our guests, performing a variety of Korean traditional dances, which was a first time experience for many. A more traditional activity guests participate in is called the doljabi, where a number of items are set before the baby and the one they grab indicates their potential future profession or path. Our Sera picked the golf club, predicting her future as a professional golfer! My son's name is Grant Thomas Hulse. He was born on December 10, 2010 at Sequoia Hospital in Redwood City, CA. Grant has always been a very happy, easy-going baby. He loves to smile and laugh and loves music. We would always refer to Grant as our little "bear", hence the panda bear theme. I've always had an affinity for panda bears so we decided that would be our theme. Matt (my husband) and I both lost our mothers to cancer and most recently Matt lost his father 6 months before we got married so we don't have a lot of relatives. Therefore, we decided against having Grant's party at a big banquet hall, where these parties are most commonly held. Instead we just held his birthday party at our home and decorated it to the best of our abilities. It took long hours over a span of 2 months, but it was all worth it. Grant was a long time waiting (2.5 years and several fertility treatments) so I wanted to make this an extra special birthday. We also wanted to instill some Korean culture in him and hope to continue with that path. I would say our favorite part of the party (as well as Grant's favorite) was the music concert held by Teacher Carl from Grant's music class. The babies and toddlers absolutely loved it and enjoyed every part of it. As for what Grant chose, he went after the book (his options were: a stethoscope, ball of yarn, money, gavel, book, and golf ball). His cake was made by Stephanie over at Cake Creations in San Mateo, CA. She tried to mimic Grant's hanbok, which I think she did a stellar job. It was a 2 tier cake so the top one was chocolate with mocha filling and the bottom was vanilla with a chocolate filling. Cake Creations in San Mateo. I made most of the poms poms myself (including the pom poms trees on the fireplace mantel). I got the small birthday banner in the middle of our living room from Etsy.com along with the party favor tags. I got the cupcake toppings from www.cakesugar.com (they were edible and blended into the frosting). The flower centerpieces, including the crystal tree with flowers, were from Edmund's flower shop in downtown San Mateo. With Special Thanks to our photographer and future sister-in-law Viet Nguyen. I was honored when asked to photograph Jalen’s 1st birthday in Bellevue at Maggiano’s. In Korean culture, the 1st birthday or Dohl is a very important event. Just look at the great job her parents did with everything! Being half Korean, it was nice for me to experience some of the traditions and some of the food. They brought me back to some things I remember as a kid (food, clothing, language). When I was very young, I lived in Korea for a couple of years, but I don’t really remember much. It was nice to jog the memory a little bit. One of the events I enjoyed watching at Jalen’s birthday was the Doljabee tradition. This tradition basically involves putting different objects in front of the baby to choose. In Jalen’s case it was a gavel, a stethescope, rice, microphone, pencils, and money. A gavel represents a Lawyer, stethescope (Doctor), rice (Abundant Life), pencils (Scholarly), microphone (Entertainer), and money (Wealthy). She first chose the stethescope and then money. Guests who entered the raffle and picked what object Jalen chose also got a chance to win prizes. Jalen was pretty good with all the attention and didn’t cry too much. It must be pretty intimidating to have 50+ people vying for your attention! Thank you Susan for having me as your photographer and also for the yummy rice cakes and red velvet cupcakes! Also congratulations to you and your family. We had planned to do a family portrait with Emily and her family before the holidays but things came up and we had to reschedule. With the cold winter we’ve waited until the weather got better but since it was so close to Hailey’s first birthday Emily decided to do the shoot that day. It has been many, many years since I’ve seen Emily, we were childhood friends who lived in the same apartment and as our families moved we went our own ways, but thanks to the internet and online social community we found one another again. Now that I’ve mentioned the past, I come to realize that Emily has always been a customer since we were kids. My sister (with my help) sold candies, ice creams, stickers and many other things I can’t recall, and Emily was always one of our first customers. Thanks Emily for your continuous support! I'm so happy to share this first birthday party with you. This is my first full party production as Jackie Culmer Photography and Design! 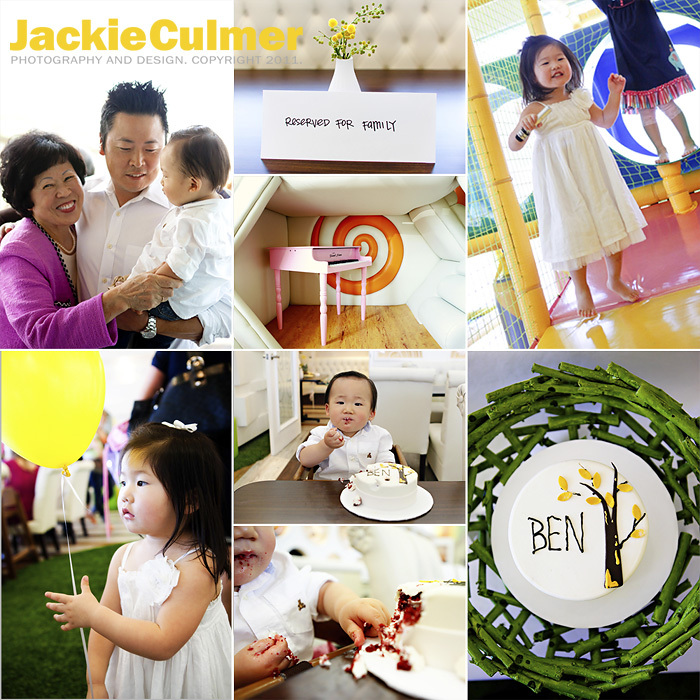 Ben's mom, Judy, chose my full party package which included design and consulting on concept, invitation, custom party signs and tags, decor and styling, shooting the event, and finally, a mini share site of the party's slideshow, and album design. When Judy first met with me for her consultation, she wasn't sure what sort of theme she wanted; she just knew she wanted it to be fresh, unique, and modern. I came up with the idea to center the theme around the classic children's book, and now movie, Where the Wild Things Are. The decor took cues from the movie with natural wood elements, moss, and twigs. We didn't want it to look too wintery as this should be a fun occasion in the spring, so I chose to pop in yellow as a throwback to the monsters' yellow eyes in the book. This turned out to be a perfect fit for the venue, The Little Prince Kid's Cafe, which had multi colored wood floors and nice, bright white walls and furniture. The cake table I styled served as the main focal point for the party. The cake was created using the invitation I designed for Judy, and elevated on a "tree stump" riser to bring in more of the woodsy feel. 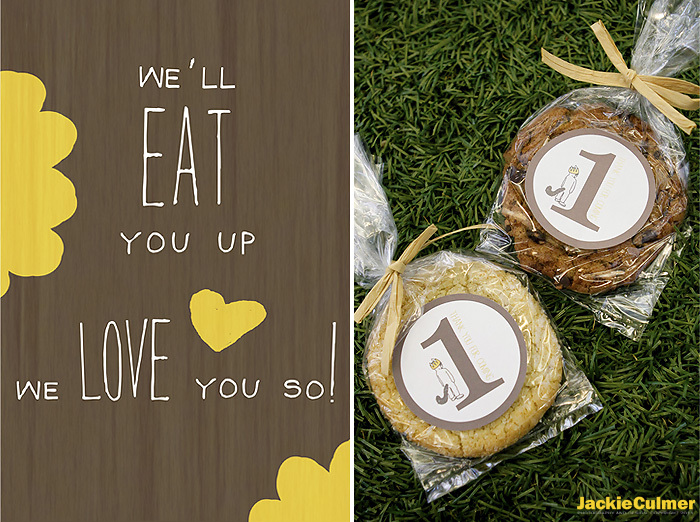 I incorporated a few sayings from the book and movie to create custom signs to display around the event, including "We'll eat you up, we love you so!" around the cookie favors and buffet table, and a custom buffet menu that had the quote, "...from far away across the world he smelled good things to eat." On the invitation, we used "Let the Wild Rumpus Start" on the front, and "he sailed off through night in day in and out of weeks and almost over a year to where the wild things are" on the back which included directions to the venue. As part of Korean tradition, Ben was given five different objects to choose from (a stethoscope, microphone, money, golf ball, and book) to predict his future. I created a sign incorporating a phrase from the movie and tags to customize this special event. Guests were given a raffle ticket and invited to place their ticket in whichever jar/object Ben might choose. Ben chose the golf ball (which I'm sure made his father VERY happy!) and a winner was chosen from the corresponding jar to receive a copy of Where the Wild Things Are and two plush dolls. It was a fun day full of loving family and friends. I was honored to be a part of it! Happy Birthday Ben! If you are interested in the party package or just photography for your small event, please contact me at jackie@jackieculmer.com or visit http://www.jackieculmer.com/. I’ve survived my first child’s 1st birthday party. And planning his party was more nerve wracking than planning my wedding. But I have to start this post with a huge thanks to Inhar Photography for the beautiful photos of Jonah’s 1st birthday. The whole day was a blur for our family and to see these images to reflect back on the day is just priceless. THANK YOU INHAR! Sign of the times . . . Jonah updates his facebook status about his party. We wanted RJ's dol theme to be simple and elegant for us, but fun for him. So we chose a color theme of red and light blue, and a theme of a red balloon against a blue sky kind of grew out of it. Thanks to help from our friends and a lot of DIY work months ahead of time, our vision for the party came to life and we all had a great time, including the birthday boy! My parents brought up dduk from Philly since there really isn't a place around Boston to get something as pretty as what they do down there. They got the traditional rainbow dduk cake as well as a platter of assorted pieces, all delicious even after traveling for a day! We got William’s dol pictures! The photog did a pretty good job of capturing all the details. I’m so happy! I’m normally not good at this detail stuff, so I’m glad with all the thought I put into it, we got to capture some of the things we did during the day. We had William’s birthday at Shanghai Reds in Marina Del Rey, and with the view of the Marina, I thought I would do a undersea/oceans theme party. I knew I wanted to work with greens, blues, and whites so it fit perfectly! For centerpieces I thought of doing live fish, but I didn’t want to deal with dead fish at the end or during the party and be stuck with a bunch of fish if no one wanted to take them home. So I tried to find a way to float glass fish in water. I attached fishing line to cork boats to float the fish… And it WORKED!!! I’M A GEEEEENIUS! And humble, but I was so excited. I was happy with the way it turned out! I halved a cork, stuck a toothpick and pasted triangle sails… voila… floating boats! I had fish and octopus balloons made by Balloon World… and they did such an amazing job! Of course Mocha made an appearance (William’s 1st stuffed doll), and my aunt found these amazing blue flowers that fit perfectly with the underwater theme. We had a Birthday Quiz for William - and a prize for those that did well. It was fun! Doljabi time! What will William choose? Let me grab the baseball! Why is everyone yelling and screaming??? Mommy wants to give me a 2nd shot for an alternate path… Law! They’re screaming again… order! order! They did an AMAZING job with a quick turnaround. I thought I might have to pay a rush fee, but they arranged it so that I was able to get the poster in time, and advised I was guaranteed to get it before the party without the rush fee. They were right! The artwork done by Heesook at Dohl Posters & More was perfect and what I had envisioned, and Kathy at KOKOLiving.com / (KOKO Printing Co.) was super easy to work with and was the one that helped me figure out the shipping and printing of the poster. I would HIGHLY recommend working with them. They also do doljabi posters, for future kids, I’ll be going to them for both needs based on my experience. Balloon World - They were prompt and did an amazing job with the balloons. My cousin recommended them, so that’s why I hired them out of 3 other potential vendors that did balloons. I had so many compliments and they were easy to work with. I would definitely use them again and highly recommend them. Flowers and fruit - My aunt did them. Just giving credit. Love her! Photography - Pai Photography. They did a great job of capturing the details and they were super economical! We were already spending quite a bit on this dol and didn’t have a whole lot of budget left. They did a great job, and were also prompt. They took all the photos above. I did some photoshopping to them (just processed a little), but I needed nice pictures to work with, and they did that for us! 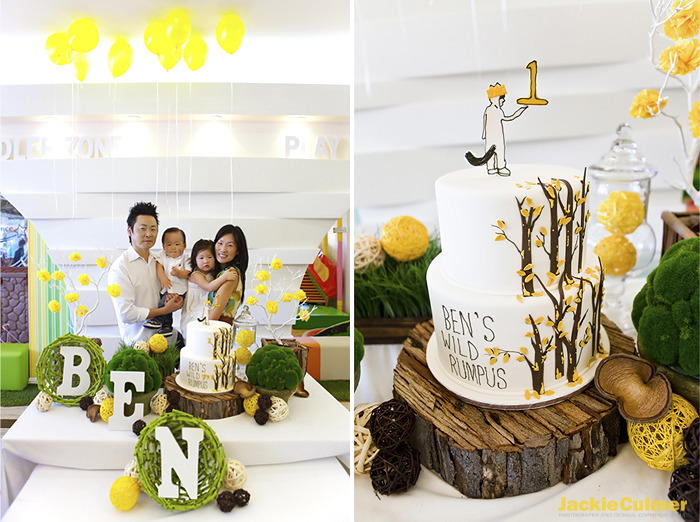 Fondant cake, dol goim, wish tree - Rented it all from Twinkle Events. They also do event planning, but I had pretty much everything planned by the time I went to them, so just needed the rentals. I rented everything for a week, and it worked out well. William’s hanbok - I bought it somewhere in ktown… if you need vendor info on that, let me know and I’ll try to dig up. OK, this post is getting long so I’m just going to end with. Thanks for all our family that made it down from Sacramento to help with the party (especially Greg’s mom who did the chocolate bars, programs, games) and also celebrate with us, and thanks to my 1st aunt for all the flowers and fruit, and thanks to my parents for helping me figure out details in LA while I was up here in Sac, and thanks for hubby for helping me tie all the fishies to the cork, make invitations, and lots of miscellaneous details… I still felt overwhelmed with all that help. Without their help though, this party wouldn’t have been possible. I’m actually glad it was fun and great, and that it’s over. hehe! No more planning! Yayyy!